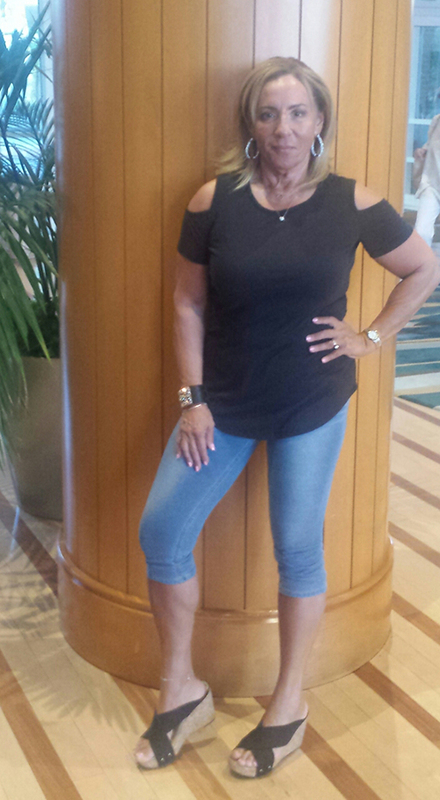 Denim is a fashion staple and finding jeans over fifty is no easy task. While we think this is just because we are middle-aged, the truth is younger women have the same problem. The only way to find a flattering pair of jeans is to try on a thousand pairs. There really are no shortcuts. I hate doing this as it’s physically draining, but the upside is once you find jeans you like you can buy a couple pairs to keep you for a while. It’s impossible for me to advise you on what brands to buy because there are too many variations within one brand. I like jeans that have some stretch as I find them the easiest to move around in and they are the most forgiving. I like mine to hit at the belly button or just below but no lower. Avoiding a muffin top is my greatest challenge in finding a good fit. I like a few silhouettes but you can never go wrong with a straight leg or a slight bootcut. Boyfriend jeans can flatter a middle-aged body but I don’t like them for me. Jeans come in many colors and I’m particularly fond of grey and black. I also love colored jeans and own green, yellow and print ones. I usually wear the same jeans for two or three years and then I’ll change up the silhouette if a new style happens to look well on me. I accessorize my jeans a thousand different ways. I usually wear some form of a boot or bootie when it’s cold and a wedge or sandal in warmer months. I love to pair jeans with simple shirts and little jackets, lots of jewelry and a great bag. The bottom line is that finding great jeans is a lot of work but so worth the effort. That feeling when you pull on a good looking, comfortable pair is priceless. I’m certain you can find jeans you love if you put in the effort. The pictures in the post are of various looks I wear all the time because I think they rock. Usually this is how I dress when I go out for drinks or dinner unless the occasion is very dressy. It’s my everyday casual dress up look.